Vietnam’s growing strategic relationship with Russia is closely connected to its oil-fuelled bonanza in a highly contested area. At the same time, it brings Russia a myriad of benefits in the world’s most economically vibrant region. The renewed Russian presence in Vietnam has predictably set the alarm bells are ringing in the Pentagon, with the Commander of the U.S. Army in the Pacific confirming that Russian strategic bombers circling the massive American military base in Guam are being refueled at Cam Ranh Bay. On March 11 Washington wrote to Hanoi requesting that the Vietnamese authorities not assist Russian bomber flights in the Asia-Pacific. Although the Vietnamese consider the U.S. an increasingly important partner in Southeast Asia, it’s Russia that tops the pecking order. A per an agreement inked in November 2014, Russian warships visiting the deep water port of Cam Ranh only have to give prior notice to the Vietnamese authorities before steaming in whereas all other foreign navies are limited to just one annual ship visit to Vietnamese ports. Located at the gateway to the Indian and Pacific Oceans, Vietnam is of critical importance to Russia. Permanent basing of air and naval assets in Vietnam helps the Russian Pacific Fleet solve its problem of having to pass through the narrow straits of the Sea of Japan to gain access to the Pacific. To be sure, the current Russian presence is minimal compared with the firepower of the 1980s, when Moscow’s Pacific fleet consisted of an incredible 826 ships, including 133 submarines, 190 naval bomber jets and 150 anti-submarine aircraft. In fact, back then Alvin H. Bernstein of the U.S. Naval War College had written the Russian buildup is “unlikely to have a specific, aggressive, regional intent since that would be quite out of character for a power” that has revealed itself as “cautious and non-confrontational”. Three decades on, Moscow under President Vladimir Putin is once again seeking to enhance its role as both an Asian and global power, and as Bernstein noted, the country wants to be “prepared for all contingencies and opportunities”. It’s also part of Vietnam’s Look East policy. In fact, much before U.S. President Barack Obama announced its pivot to Asia, Russia was already pivoting East, making inroads into once pro-American countries such as Indonesia and Malaysia. However, it is in Vietnam where Russian diplomacy is in overdrive. But first a quick flashback. Vietnam is a small country with a military that punches way above its weight. For those with short memories, the Southeast Asia country handed out resounding defeats to France and the U.S. in back to back wars. Stupendous bravery, clever battle tactics and a never-say-die spirit were decisive in winning those wars, but a key factor was that the Vietnamese had powerful friends. During the Vietnam War, Russia played a critical role in Vietnam’s defence, supplying a massive quantity of weapons. Over the course of the 21-year war Russian assistance was worth $2 million a day. In return, Vietnam offered Russia free use of the Cam Ranh Bay base. As part of this agreement, the Russians stationed MiG-23 fighters, Tu-16 tankers, Tu-95 long range bombers and Tu-142 maritime reconnaissance aircraft at the base. Cam Ranh became Moscow’s largest naval base for forward deployment outside Europe. Some 20 ships were berthed daily at the base, along with six nuclear attack submarines. The base played a pivotal role in helping Russia in its Cold War faceoff against American-led forces in Asia and the Pacific. For instance, when the U.S. Seventh Fleet sailed up the Bay of Bengal to put pressure on India during the 1971 India Pakistan War, the Russian Pacific Fleet was quickly able to dispatch nuclear-armed submarines and warships to defend India. Despite Cam Ranh Bay’s importance to Moscow geopolitically and its value as an intelligence gathering post, the Russian presence practically evaporated after the disintegration of the Soviet Union. Military bases of the scale of Cam Ranh Bay cost an insane amount of money to operate and Russia no longer had cash to burn. In 2001, even the listening station was abandoned. Although the Russian military presence declined, strong ties continued to bind Russia and Vietnam. In the backdrop of Vietnam’s high-decibel spat with China for control of the oil-rich Spratly Islands, Hanoi went on a high-octane hardware hunt. Vietnam’s legendary air force acquired 24 Su-30 combat jets from Russia, and by the end of 2015, it will operate 36 Sukhois, becoming the third largest operator of this advanced super-maneuverable aircraft. However, it is the Vietnam People’s Army Navy (VPAN) that is really beefing up. In 2009, Vietnam signed a $3.2 billion deal with Russia that includes six Kilo class submarines and construction of a submarine facility at Cam Ranh Bay. Another big-ticket acquisition is that of 50 Klub supersonic cruise missiles for its fleet of Kilo class submarines, making Vietnam the first Southeast Asian nation to arm its submarine fleet with a land attack missile. While the subs are being built, Russia and India are currently in charge of training Vietnamese officers who will work in the submarines. Plus in 2011 the VPAN acquired two Gepard-class guided missile stealth frigates from Russia at a cost of $300 million, with the Gepard fleet set to increase to six by 2017. These versatile ships are equipped for surface attacks, anti-submarine warfare and air defense. The VPAN’s other acquisitions include four Svetlyak-class fast patrol boats with anti-ship missiles; 12 frigates and corvettes of Russian origin; and two Molniya-class missile fast attack ships built with Russian assistance, with four more expected by 2016. 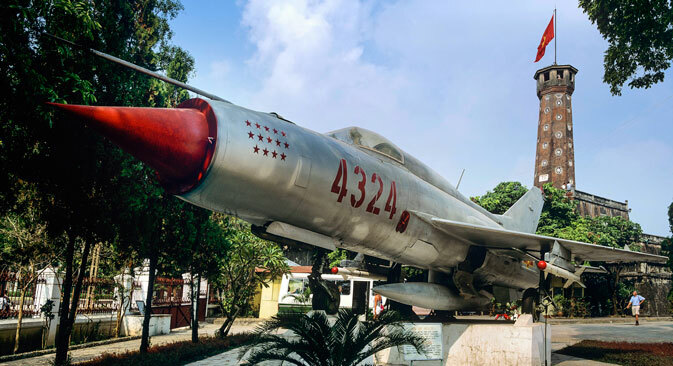 Vietnam has also acquired advanced radars; 40 Yakhont and 400 Kh-35 Uran anti-ship missiles; Kh-59MK anti-ship cruise missiles; R-73 (AA-11 Archer) short-range air-to-air missiles; 200 SA-19 Grison surface-to-air missiles; two batteries of the legendary S-300 surface-to-air systems; VERA passive radio locators; and two batteries of the K-300P Bastion coastal defense missiles. While defense gets more traction in the media, it is energy that’s the single biggest area of cooperation between Moscow and Hanoi. The Russia-Vietnam joint venture Vietsovpetro has generated big dividends for both countries. The company has produced more than 185 million tons of crude oil and more than 21 billion cubic meters of gas from oilfields in the South China Sea. Nearly 80 per cent of Vietnamese oil and gas comes from Vietsovpetro, and the income corresponds to around 25 per cent of GDP. Russia has also made considerable investments in Vietnam’s heavy and light industries, transportation, post, aquatic culture and fishing. These projects have led to other spinoffs – impressed by the profits generated by Russian corporations, a slew of other companies such as Mobil, BP and TOTAL have ramped up investments in Vietnam. Vietnam’s strategic hedging towards Russia is closely connected to its economic cooperation in oil exploration, which brings significant economic benefits to both sides. Strong defense ties between the two countries has enabled Vietnam to acquire modern military equipment, providing the country with the ability to advance joint explorations of oil and gas despite growing Chinese opposition towards these projects. At the same time, Russia is returning to reclaim its great power legacy. It offers Moscow a myriad of opportunities to secure political and economic influence with the various emerging powers in the heart of the most dynamic region on the planet.